This article was updated on 18 May 2015, and is filed under Research Provocations. Dave Hare Research Provocation: Ticket’s Please! Looking at the various accounts of stereoscopy’s history in the popular film industry, it is fair to say that the screen technology’s existence is typically framed as being tied to economic and industrial forces (Belton, 2013; Zone, 2007, 2012). The same industry and economic themes populate most initial reactions to the reintroduction of stereoscopy in the digital screen period, 2003 to the present. In the digital period, stereoscopy’s (or D3D’s) adoption is understood to be motivated by a desire to counter the threat of the internet to Hollywood, to increase box-office, and to reorient the relationship between the distribution and exhibition sectors; each application mostly benefiting Hollywood’s major studios (Belton, 2013; Bordwell; 2012). Popular critics, such as Mark Kermode and Roger Ebert, worked hard to draw attention to the way that D3D benefitted the studios much more than consumers. Kermode called D3D ‘a con designed entirely to protect the bloated bank balances of buck-hungry Hollywood producers’, for example; meanwhile, Ebert wrote that it was ‘largely driven to … add’ a surcharge (Kermode, 2010; Ebert, 2010). 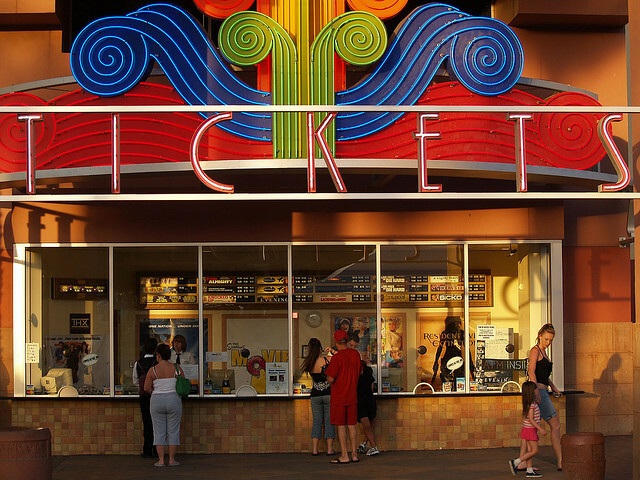 Through their efforts, the D3D screen technology came to be closely linked to ticket pricing. One way to answer this is to reflect on the broader context of D3D; that is, to frame the analysis in terms of digital exhibition. Doing so illustrates a considerable shift, namely that exhibitors can screen and audiences can buy tickets to a greater variety of films and events. This shift has implications for the sector’s unified ticket pricing model, a model that it has maintained since the 1970s (Orbach and Einav, 2007). In our contemporary context different versions of films have different prices, such as one price for conventional and one price for D3D. The extension of this variable model is that different films might also have different prices. Another question regarding D3D then is, ‘Is it simply a form of price hike, as per Kermode and Ebert; is it indicative of a larger shift in the exhibition sector toward a different exhibition pricing model; or is it both?’ In any case, ‘what does this mean for content?’ If pricing levels are in part determined by content in this new model, then how will content quality be measured? Will a blockbuster D3D film be priced differently than an art house documentary or a prestige, auteur directed production? Then, why is a film, such as the critically dismissed Hoodwinked Too! Hood vs. Evil (2011), still priced the same as critically accepted films, such as Toy Story 3 (2010). Does this mean it is only a partial shift to a variable model, a type of composite model that is focused on facilities rather than content; which is to speculate that a unified model is used for pricing content but a variable model is employed when considering the type of cinema theatre that the content screens in. What does all of this mean in regard to the perception of unfairness? There are further questions that research concerned with the relationship between stereoscopy, and economic and industrial forces will help answer and explore. These are answers that may provide counter-narratives to the canonical story of stereoscopy, as well as illustrate broader truths about contemporary cinema. Belton, John (2013, 4th-ed.) American Cinema/American Culture. New York: McGraw-Hill. Bordwell, David (2012) Pandora’s Digital Box: Films, Files and the Future of Movies, Wisconsin: The Irvington Way Institute Press. Ebert, Roger (5/9/2010) ‘Roger Ebert: Why I Hate 3D Movies’ in Newsweek.com. http://www.newsweek.com/roger-ebert-why-i-hate-3d-movies-70247 (accessed: 23/2/2012). Elsaesser, Thomas (2013) ‘The “Return” of 3-D: On Some of the Logics and Genealogies of the Image in the Twenty-First Century’ in Critical Inquiry, v. 39 (Winter), pp. 227 – 244. Kermode, Mark (11/4/2010) ‘No, your eyes aren’t deceiving you – 3D really is a con’ in The Guardian. http://www.guardian.co.uk/commentisfree/2010/apr/11/3d-avatar-hollywood (accessed: 23/2/2012). Orbach, Barak and Einav, Liran (August, 2007) ‘Uniform Prices for Differentiated Goods: The Case of the Movie-Theatre Industry’ in International Review of Law & Enconomics. Zone, Ray (2007) Stereoscopic Cinema and the Origins of 3-D Film: 1838-1952, Lexington: The University Press of Kentucky. Zone, Ray (2012) 3D Revolution: The History of Modern Stereoscopic Cinema, Lexington: The University Press of Kentucky.